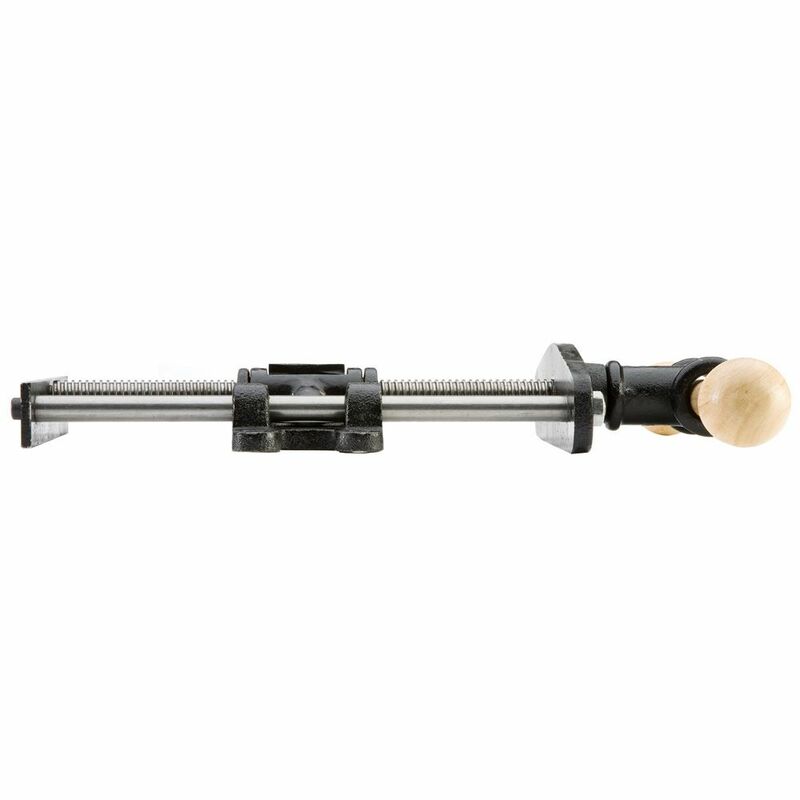 Sturdy dual guide rods eliminate racking, while the quick-release feature lets you slide the vise all the way open or closed with an easy 1/4 turn. Slides open or closed in seconds! This powerful vise is perfect for custom workbenches. A quick-release mechanism engages with a 1/4 turn of the handle, letting you make major adjustments almost instantaneously. Two 3/4" dia. solid steel guide rods provide absolute resistance to racking, while an extra-wide 9" wide handle-plate delivers maximum stability to handle any project. Includes a solid hardwood handle. 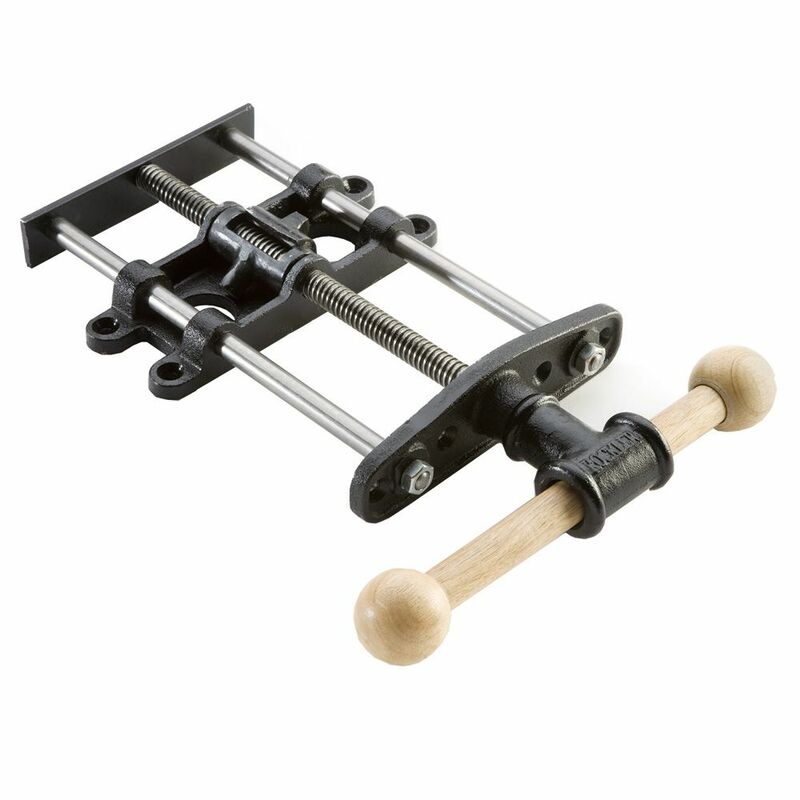 3/4" diameter guide rods keep jaws parallel, even when clamping narrow objects on one side of the vise. 8-3/4" overall travel before adding wooden jaw. Mounting hardware (1/4" lag bolts) not included. Great vice - real craftsman feel - could use a template. This has a great feel and is heavy and solid! Very effective now that it’s in place. Dog holes coming soon. The design of my bench has the upper frame inset from the edge of the workbench top, so that I can clamp all the way around. If it were flush to the outside edge, then that frame would also be the backplate for the vice. Unfortunately, in this case I needed to drill through 3 boards for the guide rods and gear rod. The frame and backplate were in place when the vice arrived, so I couldn’t lay them flat on the bench to drill. If there were a template, that may have helped. I burned a lot of time trying to get the holes aligned so that the rods could pass and still fit within the receiving bracket on the other side. Forstner/Marley bits ended up being the 5th and final solution for hand drilling while standing next to the bench. This looks great on my roubo styled bench, with 1 1/2" oak faces this looks very strong indeed. 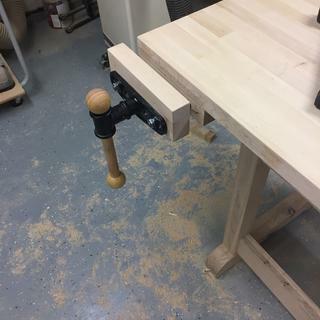 I wanted a good side vise for a bench I was building, kind of a poor man's Roubo style bench. Mostly made out of common pine 2x4's and 2x6's with some heavy oak inserts for the bench dog holes. I'm really happy with the vise except it would have been helpful to have an instruction sheet. I was able to figure that out though. 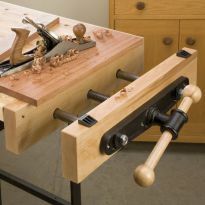 Will probably buy and install the end vise in the near future as well. Very prompt shipping as usual with Rockler. The most common complaint I saw in the reviews was the absence of installation instructions and a template. 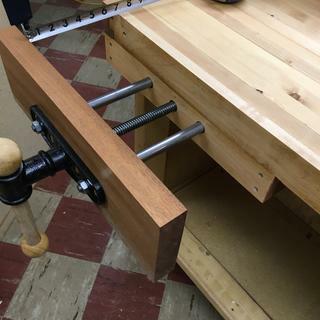 Here is how I installed it: Per the instructions on the box separate the vise into two sections, and clamp the vise plate under the bench top and flush against the bench mounted vise block (or, if possible, clamp the wooden vise block to it's position on the bench; and permanently mount it later). Using carpet tape, attach the vise face to wooden vise block. Put a 3/4" drill bit (preferably a forstner bit) through the vise plate holes for the guide rods and screw and mark the wooden vise block. 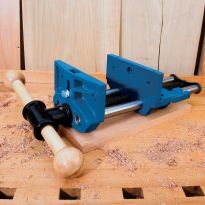 Now either remove the vise block and attached vise face and drill through both on a drill press or use a hand drill if the vise block is permanently mounted. Separate the vise face and reassemble the vise.This procedure eliminates the errors attendant to attempting to measure for the location of the holes. I used a 7/8" forstner bit to drill the holes and it gave plenty of excess space for any slight misalignment. OBTW, I've had zero problems with the quick release feature. Great vise. Face plate proud by 3 inches to hold large pieces vertically with pegs. Vise is terrific. Installation is simple and it's fun to "personalize" it with the wood jaws you make yourself. Working great so far. Should have come with installation instructions. Should have bought this years ago instead of messing around with a 6” vise! 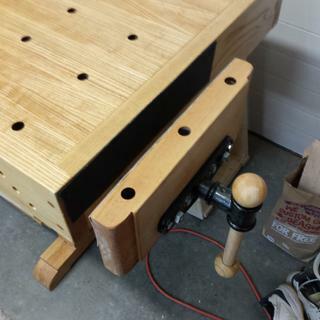 Installed this vise at the end of my work/runout bench with a 21” wide hardwood face. This lets me securely clamp long boards. Slight racking of face when clamping at end of 21” face with the guide rods at 6” centers but that was my choice and not a big problem. Quarter turn quick release works great. Instructions were just so-so. Installation not a problem with a little planning. 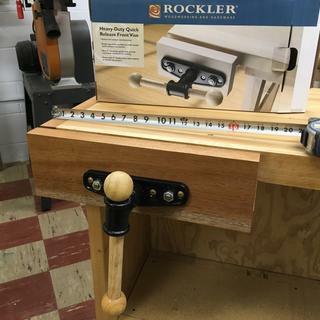 The Rockler Quick Release Front Vise was delivered on time and installed within 1 hour. 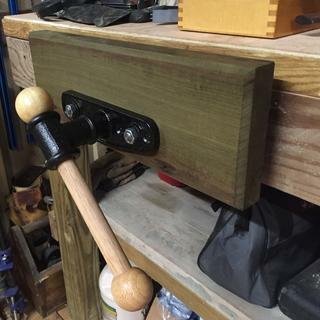 I installed both a quick release end vise and this front vise on a newly built workbench. Hard to fine quality like this these days. Recommend purchase. Nice vice for the cost! So far this was an excellent addition to my work bench. Plan on purchasing the end vice soon. Was not sure at first but after using the vise for a month I love it. Awesome vise , easy to install and works as advertised. It was easy to install. And I love the quick release. It saves a lot of time. I am very happy with it. I purchased the end vise last year. Installation was simple except having a 6" thick bench required some elbow grease. Other than that I enjoyed having it, which is why I purchased another one. 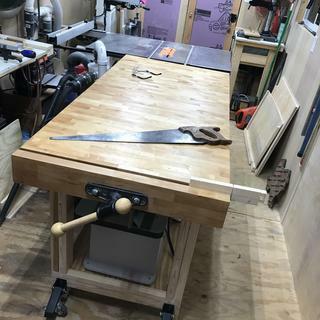 I've since built a thinner bench with a front vise in mind. 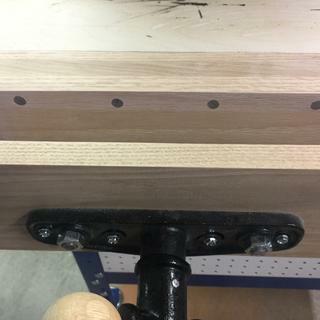 The front vise fit and works perfectly. Performed as expected, solid value. This was a great purchase. 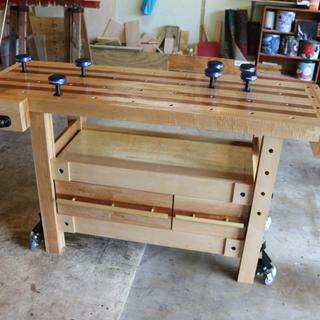 I use it on my portable workbench for demonstrations. I began skeptical, but it’s a winner!! The sale price was an added benefit. Ordered the face vice to upgrade a salvaged work top. I've had very little use so far but the feel and quick release action are very good. Installation was straight forward once I found a construction screw sized for the vice face (#12 x 1 1/4) and 1/4 x 2 inch for the main plate to the work top. A 3/4 inch forstner bit will center in the guide rod and screw holes to make a pattern to drill the face plate and apron rail. Found that I had switched the main clutch cam to the left side when reassembling the vice after installing the face plate. The main clutch cam tab should face right when viewed from the front like the box says but fixing that mistake was easy. Set up was a little more difficult than I thought. I found a you tube video that helped but Rockler could do a better job on that part but the vise itself is excellent. We buildi a workbench,for my son, the wise works great. 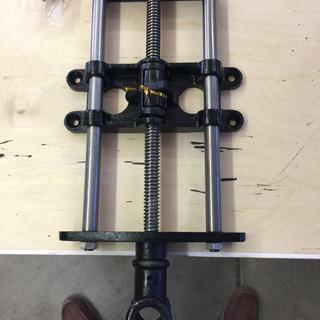 Great working vise - mounting was easy and it works as expected. I put it to work right away holding components for some mortise and tenon doors. Planing was a breeze. Love it! The last addition to my new workbench. This is a great vise, well built, easy to install, and works flawlessly. 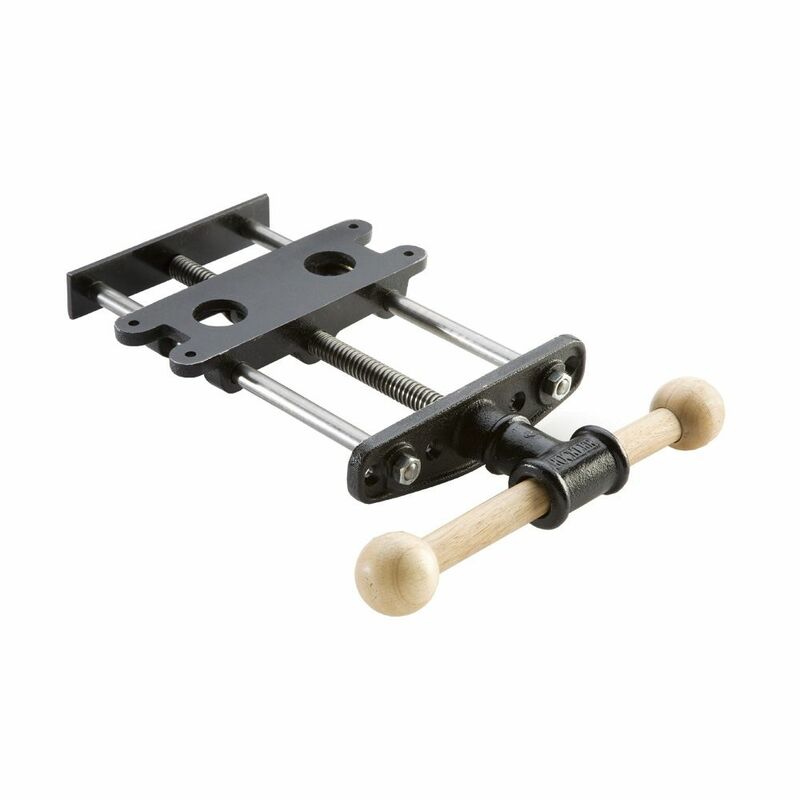 I like the quick release mechanism as well and once something is clamped, it is not moving. This is a 9" vise but I went with an 18" vise jaw; every inch is functional and holds secure. I planed down a reclaimed piece of poplar that was in a 1900 farmhouse and was part of a fireplace mantel. 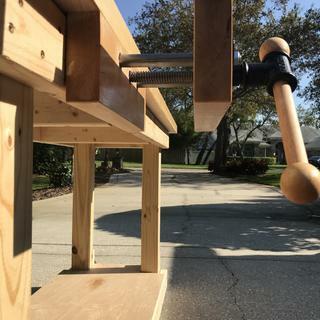 Photo shows the nice character of the wood (no staining, all natural colors) and it matches up great with the vise hardware. 117 year old reclaimed farmhouse mantel. In a single picture a mini workbench derived from an IKEA trolley fitted with your front vise and various T-track pieces and accessories. Sturdy and extremely compact. Fits perfectly in my small study room. I am enthusiast about it! Thanks for developing these products. F. Vagliani, Milano, Italy. Very sturdy and well constructed. Will be a part of the workshop for many years! It is a fine vise. It is all installed and is very handy. Glad I spotted it. Excellent addition to my shop. The vise is just what I was looking for. Would highly recommend it. 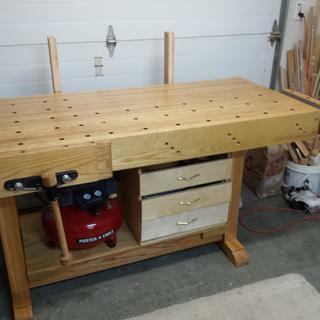 I would recommend this vice.It is sturdy and well made.Installed on Torsion top Assembly/Workbench Top.Added 1" oak spacer cleat to bottom of bench screwed off thru MDF and into internal framing with bottom plate installed on cleat .Did not add back chop bench apron works fine.Removed front plate to template front chop,must drive out pin in handle. 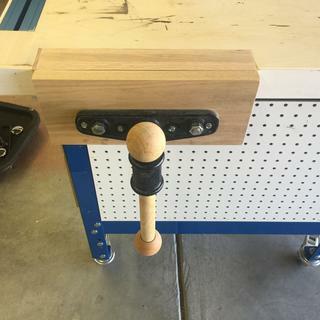 I already had a front vise so I added this to my bench as a tail vise. I had to take my bench apart to provide space for the tail vises depth. Once I had the base of the bench back together I positioned the table top on the base upside down. This made it very easy to install the vise as one was not working overhead. The quick release mechanism was very easy to install as I remember how difficult operation was when working overhead. I mounted a 15" piece of maple as the vise face and glued on some leather on both faces to prevent marring the wood. This vise works perfectly. I found the quick release mechanism a little tricky at first, but after a few times using it I don't know how I could do without it! I just installed the vice and it works great. It was easy to install and the quick release is really nice. I was a little uncertain when I purchased this vise after reading some of the reviews about installation challenges. The installation instructions are on the website under Technical Downloads, not in the box. It was actually a lot easier than i expected. The quick release nut just has to be inserted correctly. You can shoot a quick photo of the nut with your smartphone when you pull it out of the box to reference when you put it all back together during installation. I spent $11 on some maple and built some nice jaws. Once installed, I love it. It is solid and well designed. If you are looking for a vise look no further. The vise works like a charm. The quick release device is a must. Love that the vise came with a wooden handle. Installation was straightforward. Device works really well especially the quick release. I would recommend to a friend. 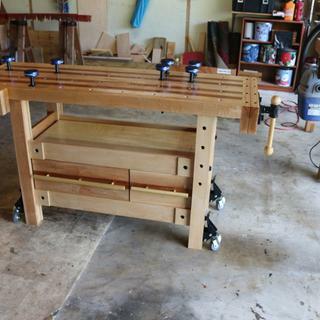 I can always depend on Rockler associates for excellent service. Always friendly. I have not installed the vise yet (my bench needs to be modified first), but I can already see that this vise will last a long, long time. It is heavy, sturdy and from what I could tell by so far is well machined. Well made, easily installed and works as expected. Really great product and reasonably priced. Wood vices for end of workbench and front of bench. I really enjoy the ability to quick release the wood vice and pull it out. Both were easy to install. I also bought dogs for the holes in the jaws of the wood Vices and in the holes that I put in the workbench. My whole workbench is riddled with holes spaced equidistantly. 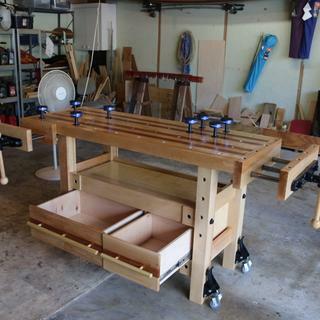 I built two items for my daughter's Pilate studio this past week. It was a dream to be able to pin the base of what I was building. 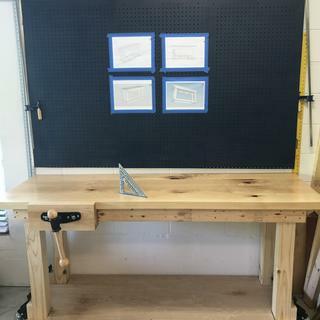 My friend just installed one on a workbench we made him. It works great. I'm putting this one on a mini-workbench. Pay for my shipping and I'll tell you why I chose this item. Looked like the right tool for the job at a competitive price. my dad has one and loved it. price and will not scar wood I am working on since it is wood itself. Great deal on sale. Strong reviews. 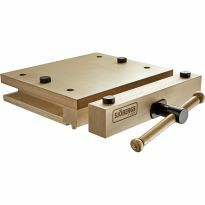 An economical choice for a bench vise that does most everything I need for making wood components. Looks like a great item to use. I have a bench with two vises but no quick release. I plan on adding this - I've always wanted one and seeing it on sale made up my mind. 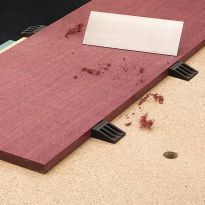 I had seen this and messed with it when I visited the Rockler Altamonte store for a hand planer demo...it looks and feels solid. 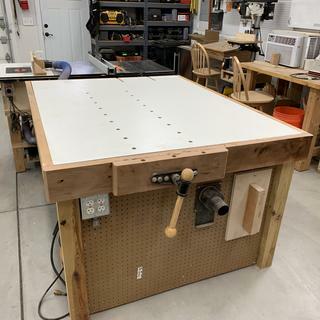 I'm nearly done crafting my workbench and wanted something that fit the look. I readied 2 pieces of hard maple left over from the top of the bench that will work perfectly as the jaws for this vice. Price and quality. It is perfect for what I need. Looked like the best overall value for a retrofit front vise. Like the quick release and size. 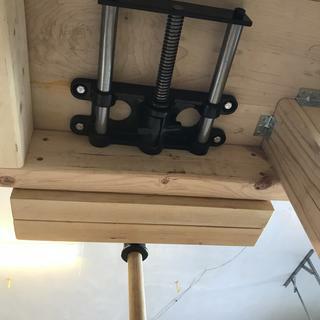 built a new bench and needed a quick release vise. This vice will work well with using similar wood for the jaws. This is why I chose this over a vice that sticks up over the edge of the workbench. Had a work bench but no vise. Rockler quality and great price. Great price on a needed addition to my shop. 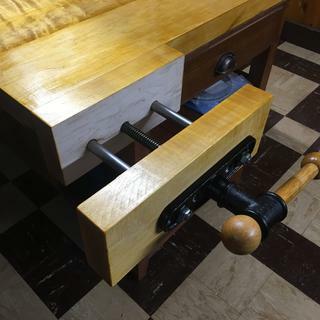 Been using clamps to substitute for a vise. This will be most welcome. Been looking for a good bench vise and thid one looked like a good buy. I am building a new workbench for my shop and this is the vise I chose to add to it. 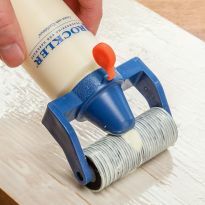 I have a number of Rockler products in my shop and have been happy with their quality and performance. Looking forward to receiving and installing this new vise. Have purchased from Rockler before, hassle free and quality tools. Quick and easy, time is money. This is for my husband's workshop, it is something he wanted to use his projects. My bench is 2 3/4" Bamboo. How long should the lag bolts be that mount this vise underneath? BEST ANSWER: I was able to use 2” carriage bolt on a 1 3/4” top, but I countersunk them. So 3” for you, or 3 1/2” if you flush mount. What are the dementions of this vice? Width and over all lenght? BEST ANSWER: 17 5/8" long, 2 1/2" high, 9 5/16" wide. BEST ANSWER: You can make the jaws wider. My vise jaws are 20" wide which gives me 6&3/4" to one side to hold boards vertically. I believe that is enough to dove tail an 8" board just fine. 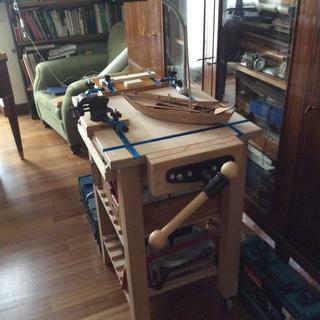 Anything wider consider building a Moxon Vise in addition to this one. the "swinging door" on my self release nut keeps falling off. It is on my left when facing vise. Do you think it is assembled wrong? Let me know. BEST ANSWER: I had the same issue when I reinstalled the vise on a new bench. I had installed the bottom plate backwards. Yes it fits nice either way, but the knob on the plate should be on the left when looking at the bench. It would be nice if the directions stated that or showed an image. I had the same problem. I had assembled it incorrectly. How do you assemble & position the quick release nut? The technical document is not helpful. 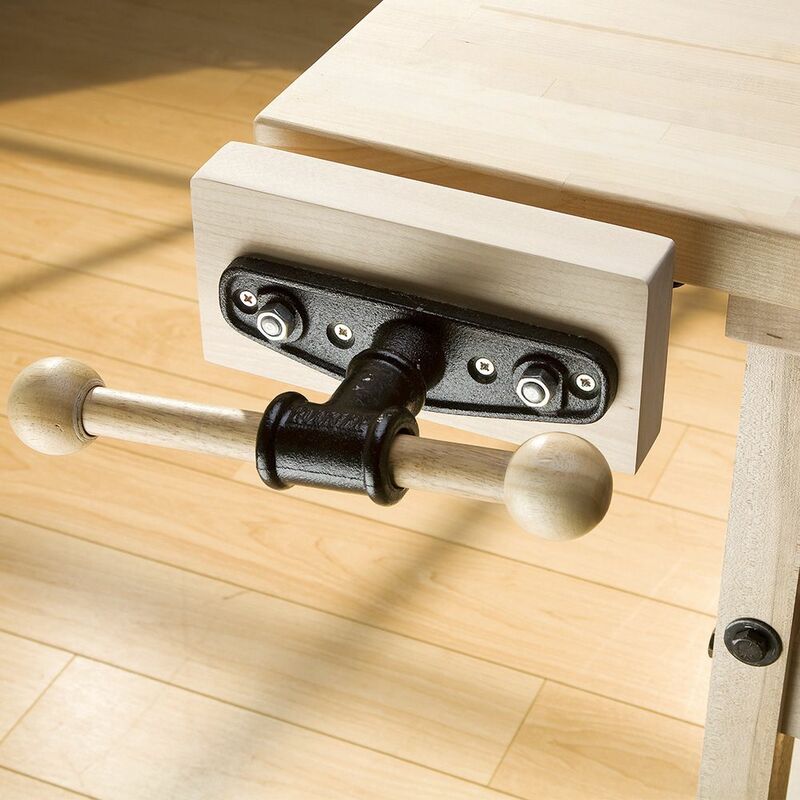 BEST ANSWER: The swinging "door" (smaller half) will be to the left, when facing the bench and looking at the vise. BEST ANSWER: I opted to use 2 jaws that were the same hight to one another . My bench top was only 1 1/2 thick. I wanted more support. It's your choice. You can absolutely use the bench as a jaw which is what I did. I used a 2x5x11 piece of oak for the front and my work bench is 1 and 3/4 thick. Just like the picture. It works perfect I also have bench dogs in it. for me both boards worked fine. I made the back board removable so if i needed more room, i had it. If your table top is thick enough you won't need a back board. I would use the back of the bench. I used this approach on a vise on another bench. Using the bench face as the back jaw works just fine! How much vertical clearance do I need under my bench top? BEST ANSWER: Installed, the vertical clearance is 2 1/2 inches. But remember that you have to attach the vice mechanism from the underside. I bolted it directly under my bench top which is 1 3/4 thick. If very flexible in that regard. I think that you can decided it you wish to pad it out so as to make larger size clamps. You will need 2 and a half inches. If there is a brace there just drop it down and you should be fine. 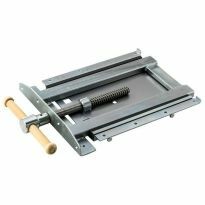 Is it possible to use bench dogs with this vise? It doesn't look like there is an integral bench dog like some other vises. BEST ANSWER: yes. The vise does not come with the wood jaws. 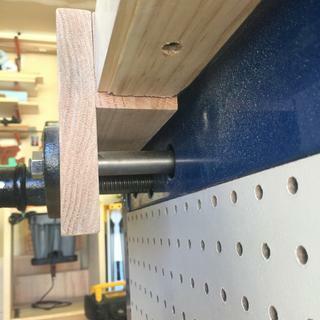 You can drill a 1" hole in the vise jaw and then line them up with holes in the table. This vise kit is hardware only. No wood included. This allows the usere to make the vise jaws to suit their needs. By making the vise jaw at least 1.5" to 3" thick allows for the inclusion of dog holes. Shop Notes magazine (now out of print) has some good bench face vise examples to draw ideas from. 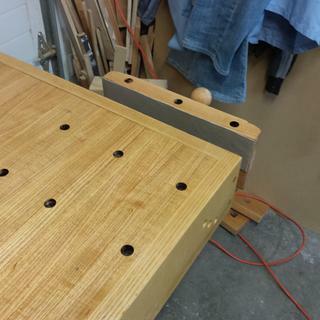 No it didn't have an integral bench dog, but I drilled a pair of 3/4" holes in the outer block and lined them up with holes in the bench itself. I put 2 on my bench and use them all the time. You would have to bore vertical holes in the face plate to insert a dog. What kind of wood do you recommend for the jaws? 1-1/2” thick there are a lot of different hardwoods you can use. Hope this helps. The wood for the jaws is sacrificial to the work you are doing. So use material that grips but doesn’t crush your work. On my vice I used some scrap rosewood which is very stong and doesn’t crush easily. But then I make things out of hard hardwoods. 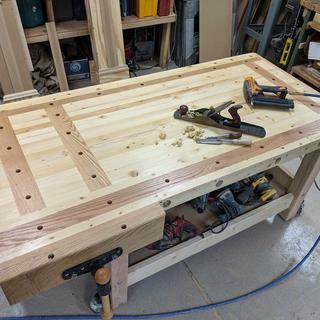 I built my workbench with a maple top and I used Maple for the heavy duty vise. I made sure I had both sides (table and vise) to match so I get an even clamp with equal pressure on all four corners. It works great! My preference is to use something soft. I had some pine I used in mine. It’s really personal preference. You’ll also hear some people say they don’t have an issue with hardwood jaws marring softer woods. Some answers here indicate this vise can be installed without a rear vise jaw. Does anybody think this configuration causes any instability of the overall vise, since the guide rods don't have the added support of a rear vise jaw? I use the vise just like it is pictured. I have had no issues with it letting the wood slip. A rear block of wood will need the holes drilled for the rods so it won't offer that much more support if any. This vise is very heavy and stable holding wood when planning or whatever. I added a back jaw to match the dimensions of the front jaw. If I had a thicker bench, I would not have. My bench is only 1 3/4 thick. Where can I get some wooden jaws for this vise??? BEST ANSWER: I made my own out of Oak. I planned it to insure that it was flat and cut it to fit. My husband made his own He used a 2 x 8. 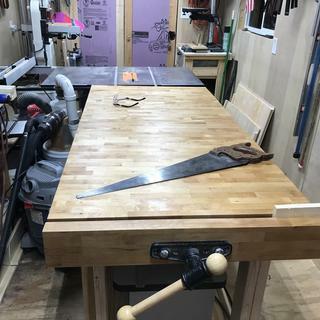 My top was made from hard maple (bought from a lumber yard - not a big box store) , I used the cutoff excess pieces for the vice and just hand-planed the back plate until it was perfectly flush with the workbench top. BEST ANSWER: I ended up with a front and back face at 14 5/8 x 4 3/4 x 1 3/8 inches, for a few reasons. It works great. you can put what ever size works for your set up but once you get a couple of inch's to the outside ends of the vise you get more twisting of the wood and the vise. Of course it depends on what kind of work you are doing. I wouldn't recommend it. Maybe about three or 4 inches larger than the vice. 12 to 14 inches is perfect for this vice. Can this vice be assembled on a bench with skirts? BEST ANSWER: The bottom oft the vice is attached to the underside of the top. Don't know how wide the skirt is. 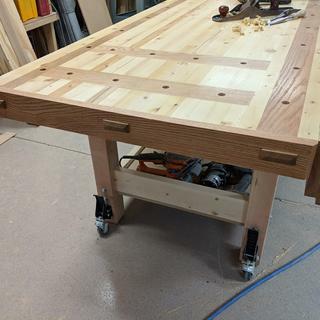 If deeper that the countertop then you would have to drill holes in it or put a spacer between the vise and the underside of the countertop to clear the rods. Yes. I have the Paul Sellers type bench with skirt's and installed it. When building I eliminated the first board under the top on one end. If you are retrofitting you will have to cut it out. Blocking would be needed under the bench to support the vise. The apron might be used as the inner vise jaw if it is strong enough otherwise an inner vise jaw would be necessary. What is the maximum thickness of a benchtop that this can be installed under? Can increase the size of the plate mounted on the vise. I dont believe that thickness is an issue. The thicker the better because the jaws will get bigger. 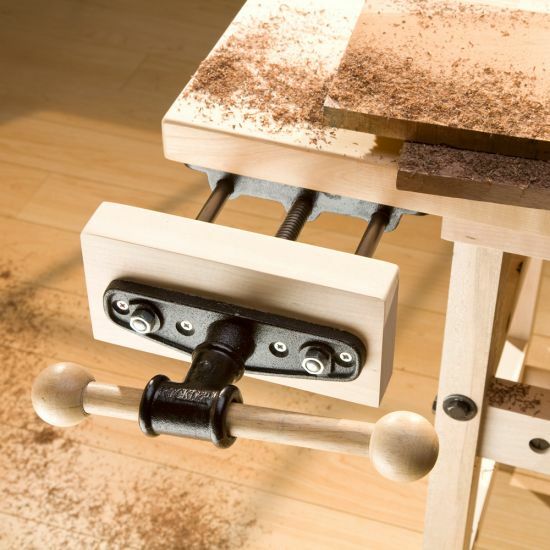 Do you provide wood for vise jaws? 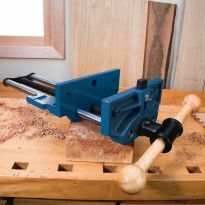 The wood for the vise jaws is not included with the vise. Nope. Sorry, Grady, I do not. How wide does this open? Hi, what is the spacing of the GUIDE rods center to center? I.e. Outer left to outer right ignoring the center. Many thanks in advance. Why would you want to know? Never gave it a thought when I installed mine. How are you planning to use it? Vice arrives with a flimsey wire-tie holding the quick release: if I remove it the quick release (one side) falls out. I want to build cabinets underneith the bench and would not be able to replace this when it wears out: any answers? BEST ANSWER: I found this vice to be far less "beefy" than the one I was replacing. The old one (40+ years) cracked the cast iron follower on the quick release mechanism. I would not bury this or any vise where you could not access the quick release mechanism or replace the entire vise if necessary. Just installed vise and have bad problem with racking. Any suggestions ? BEST ANSWER: Without knowing how you mounted the vise, I cannot answer the question. Can you send me pictures? BEST ANSWER: Probably installed it upside down. If installed correctly it can't fall off. I'm trying to build a handle for mine, what diameter of ball is used on this? What is the overall length of the handle? BEST ANSWER: The handle that comes with the vise is: 2" ball and 12 1/2" overall length. What are the dimensions of the mounting plate (the part that screws into the bottom of the bench top)? Thanks! What are the exact dimensions of the vise plate? Can you remove the rear plate (presumably by unscrewing the hex head screw)? BEST ANSWER: 8 1/2" end to end and 2 3/8" top to bottom at the widest point. Yes, you can remove the rear plate using a hex wrench. What is the difference between a front vise and a rear vise besides where one decides to locate it on a work bench?